With a 20% jobless rate, the young French are, in the words of President Sarkozy, being "ceaselessly sucked in" by Britain. The Eurostar generation is packing its baggage and heading for London, the city of dreams. At first the authorities laughed off this youthful exodus as nothing more than an age-old tradition of the French going off to civilize the world. Now, they're getting desperate. They have to turn things around. And what better way to shatter the great British dream than a serve of old-school British cooking? Yes, my young French friends. This is what's in store for you across the channel. You can forget about fresh croissants and heart-warming coffee. It's time for microwaved muffins, mushed up egg, soggy bacon and plastic cheese. Welcome to the land of opportunity. Want to be careful photogaraphing food on public transport! 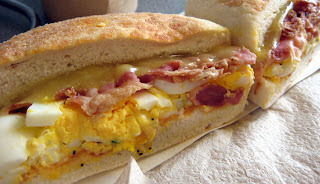 Your photographs have given me a hankering for a fried-egg sandwhich. I love your posts!